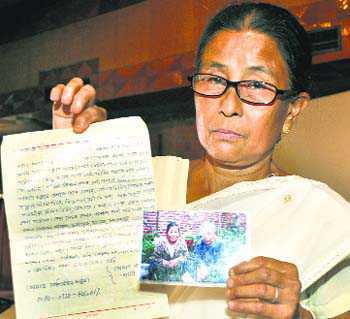 Leong Lin Chi alias Pramila Das, 59, from Kehung Tea Estate at Makum in eastern Assam was born to Chinese-origin father and Lushai tribal mother. Separated from her parents in 1962 when she was just six, she still seethes silently at the “Chinese aggression”. Hundreds of Chinese-origin people who were living in the eastern Assam’s Tinsukia district, especially in Makum, became victims of the “Chinese aggression” as the then Indian Government resorted to mass detention and subsequent deportation of Chinese-origin but Assamese-speaking families. “I desperately want to meet my parents in China. I hope the Indian Government facilitates my journey. I still can’t forget the day my parents were herded into a train at the Makum railway station for deportation. At that time I was at my grandmother’s place at Borjan Chariali in Tinsukia,” Pramila said. Her father Leong Kok Hoi was a carpenter at Rangagora Tea Estate in Tinsukia and her mother Chanu Leong was from Lushai in Mizoram, part of the then undivided Assam. “Many Chinese workers were brought to Assam in the early 19th century by British tea planters. Thereafter, more Chinese people migrated to Assam voluntarily and got married to local women and became part of the greater Assamese society. They were mostly illiterate, unaware of the political turmoil. But the 1962 war changed their life for good,” said Rita Chowdhury, author of “Makam”, a novel in Assamese on Chinese-origin people in Assam. She said many of these Chinese-origin people and their families were detained after the war by Indian authorities and deported to China as questions were raised about loyalty to their country during the war time. Though some of them were later released, they found their property in Assam either auctioned or looted. “They are living in identity crisis,” she said. Chowdhury has urged the government to provide necessary political and social protection to the Indian-Chinese “living in silence, fear and insecurity”. She has also launched a campaign to mobilise funds to facilitate Pramila’s visit to her parents in China with the help of the Indian Government.